Jewish community life in Buffalo began in 1847 with the founding of Temple Beth El. A dominantly German Jewish community transformed in the 1880s as Eastern European Jews settled around William Street. Intense religious and commercial vibrancy emerged with new synagogues alongside Jewish grocery stores, kosher butchers, clothiers, and more. From this east side milieu, lyricist Jack Yellen ("Happy Days are Here Again") and composer Harold Arlen ("Over the Rainbow") emerged as part of a new generation shaping local and national American life. On the west side, Temple Beth Zion, the Jewish Federation, Jewish Community Center, Jewish Family Service, and Rosa Coplon Jewish Old Folks Home built institutions on and around Delaware Avenue. Jewish areas in Humboldt, North Buffalo, Kenmore, Amherst, Getzville, and Williamsville developed over time. Camp Lakeland continued earlier traditions of summer camping. Throughout the 20th century, Jewish Buffalonians made their marks as entrepreneurs, distinguished lawyers, award-winning writers, and Nobel Prize scientists, among other careers. 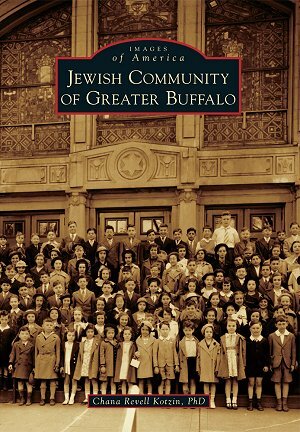 The Jewish Community of Greater Buffalo showcases Buffalo and Niagara Falls Jewry over the last two centuries.